Blood curdling screams at night? Halloween must be coming. August to January is Koala breeding season with most young (called a joey) born over the summer months. “I was awoken at 4 am by a dreadful noise in our yard – blood curdling screaming. Couldn’t get back to sleep. At 5 am the local birds let me know some ‘foreign’ creature was still around. 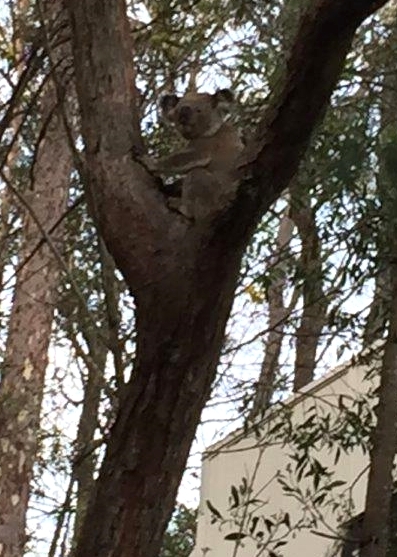 I took this photo of a Koala which had just leapt off our back terrace into one of our gums. He was roaring loudly as he ascended the tree. He then spent the day sleeping in an adjacent Tallowwood. He looked well fed and healthy. keeping dogs inside or chained up at night when Koalas are moving around. Koalas are at particular risk when they come to ground to move around urban backyards. keep your dog on leash walking in the Reserve.